Found along side a temporary pool in Hells Canyon, Yavapai Co., Arizona, USA. March 2011. The spider was about 10 mm in length not including the legs. Notice the four dark eyes set high on the cephalothorax (fused head and thorax). 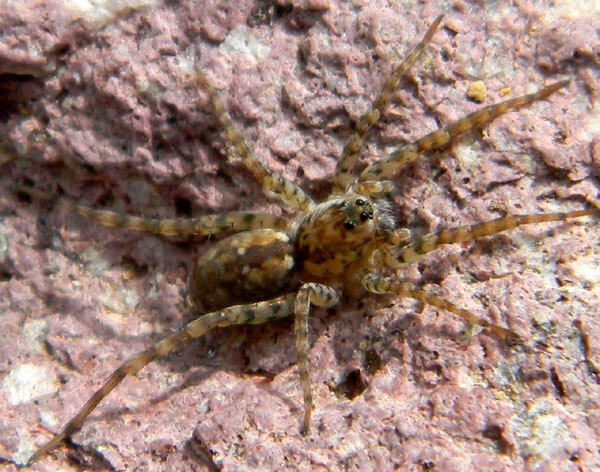 Spiders are predaceous on insects and also other spiders. Prey tend to be especially abundant near water sources because water is so scarce in the desert. Arctosa wolf spiders hunt by walking and running on the soil surface close to water's edge. The coloration and pattern closely matches the substrate helping them avoid predation themselves by birds and lizards. Wolf spiders have four large eyes at the front of the cephalothorax (and a row of four very smaller eyes along the front edge). In addition there are specialized hairs that can detect minute vibrations nearby that could be a potential meal item.